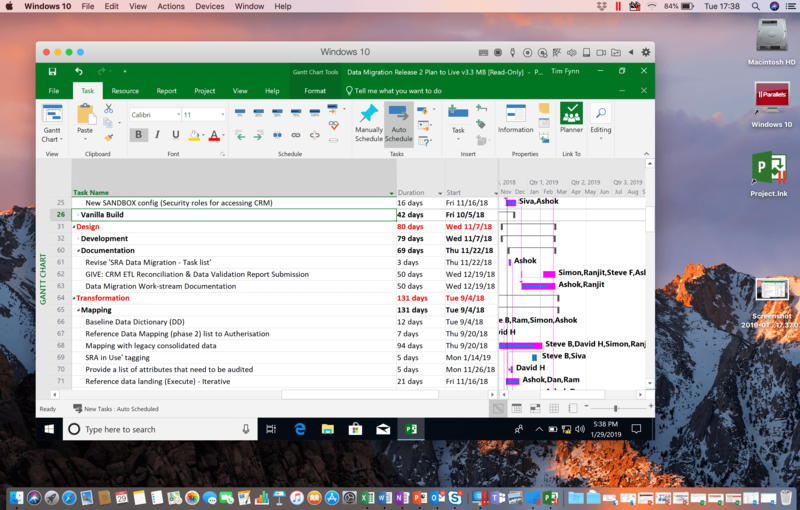 Microsoft Project is the best project, portfolio, and resource management solution—but it’s not available on macOS®. However, with Parallels Desktop® for Mac, Apple® users can use a Windows virtual machine (VM) to run Microsoft Project on Mac®. Download a trial of Parallels Desktop. Purchase Microsoft Project and download the .exe file in your Windows 10 VM. Start using Microsoft Project to get your job done! Eco-friendly choice to minimize the amount of electronic waste a single user produces. If you’re still deciding if Parallels Desktop is right for you, continue reading to understand how a program manager utilizes virtualization to run Microsoft Project. As a self-employed program manager, Tim specializes in large-scale data migrations and the development of sustainable business intelligence (BI) and analytic solutions. He has a wealth of experience in both IT and capital asset delivery, as well as general management, operational, and strategic roles in asset-intensive industries and regulation. Like most consultants, Tim needs slick and stable IT to allow him to focus on the real issues. He doesn’t want IT issues to constantly be distracting him. Parallels Desktop offers a reliable platform that allows him to deliver. As an avid personal user of Apple products, Tim also wished to migrate his work life to Mac. However, for most clients he needed to use Microsoft Project as a Gantt chart management tool. Being able to manage multi-project plans is an essential element for any program manager. Unfortunately, Microsoft Project is one of the few pieces of Microsoft software that has not been developed to run on macOS. After online research, Tim concluded that the only successful way to use Microsoft Project on a Mac was through a Windows virtual machine. He discussed the issue directly with Apple, and they recommended Parallels Desktop as a solution. 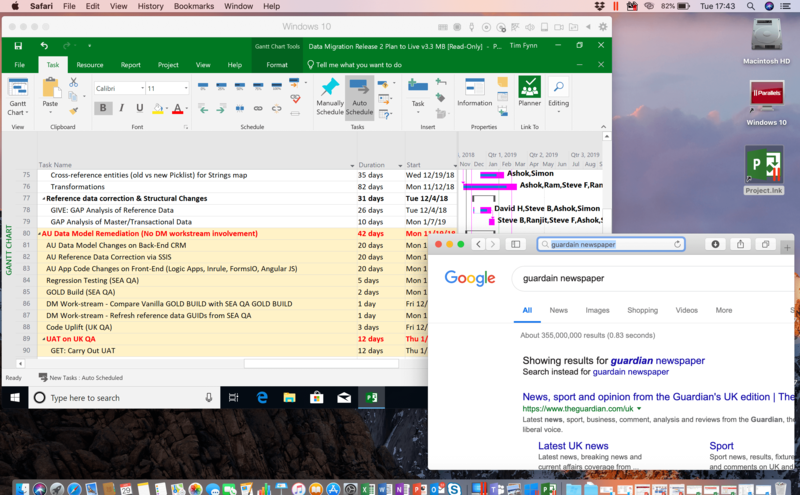 Following a very simple installation of Parallels, Tim can now use Microsoft Project natively within a Windows environment on his MacBook Pro®. This means there’s no translation between products claiming to act as a Microsoft Project editor—quite simply, he’s running a Windows version of Microsoft Project on his Mac. It has proved to be an excellent solution for Tim. Tim wholeheartedly recommends Parallels Desktop, which he has now been using successfully for several months. Installation was simple, and there are many configuration options that can be changed. (For example, the amount of memory dedicated to the Apple or Windows operating system.) This gives greater flexibility to the user. Tim hasn’t had any issues with Parallels Desktop at all, and the product is extremely stable in every way. Tim also added that Parallels® Toolbox (which comes included with Parallels Desktop) has been useful. He particularly likes the disk cleaning tool, which ensures his laptop is always operating efficiently. If you’d like to use Parallels Desktop to run popular Windows programs on Mac (without rebooting! ), download a free 14-day trial.